Orphaned teen Sinoxolo Cotyi outside his aunt's rickety zinc shack in Kwa 5 squatter camp, he beat all odds stacked against him to scoop seven distinctions in his 2015 matric results. Photo: WCN/Peter Luhanga. AN orphaned teen from an Mdantsane informal settlement in East London has proved it is possible to beat the odds. 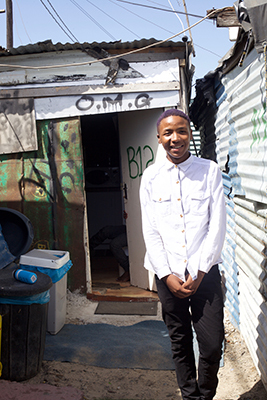 After the death of both parents, 17-year-old Sinoxolo Cotyi moved to Cape Town to stay with his aunt who lives in Kwa 5 squatter camp adjacent to Dunoon township near Milnerton. With his aunt working as a domestic worker in Table View—an affluent suburb near the Atlantic coast—Cotyi surmounted conditions of dire poverty to emerge as one of the best of Mzansi’s 2015 Matrics, scooping seven distinctions! His aunt never got to apply for the state’s foster care child support grant and only provided for him with her meagre earnings as a domestic worker. “Living in squalid conditions in a squatter camp… the poverty in the area… that is seriously hard. To live was my driving force to work hard in school,” said Cotyi. He had to overcome public transport nightmares to get to school at Sinenjongo High in Joe Slovo Park township, 10-kilometres away from Kwa 5 squatter camp. “Taxi bosses strikes would impact me going to school. I would miss classes depending on the duration of the strike. Sometimes taxis would get stuck in traffic during peak hour and I would get to school late. You really had to wake up very early to make it for school,” he said. He said because the zinc shacks were built so close together it was difficult to study at home as neighbours’ quarreling or even just talking was so loud it sounded like it was in his own home. Shebeens were also all over the place playing loud music at all hours, making it difficult for him to study. He said his classes were also housed in mobile classrooms which were extremely hot in summer and extremely cold in winter. He thanked study groups established at the school, saying they were the reason he achieved seven distinctions which secured him a bursary to study forensic science at the University of Cape Town. “When I heard about my results (matric) I was very shocked. I expected to get distinctions and my initial goal was to get at least five distinctions. When I got seven distinctions I was so shocked and happy. Even if I wanted it I didn’t expect it. I was so overwhelmed’,” he said. He advised other poverty stricken youths to emulate his hard working spirit and believe that nothing is unconquerable. After his university studies, he said he wants to get his aunt and his 12-year-old brother out of poverty and provide them with better living conditions. “I want to give my aunt and brother a better standard of living conditions than what we have now,” he said. School Principal at Sinenjongo High Khuselwa Nopote said her school was grateful for Sinoxolo’s outstanding performance. “He (Sinoxolo) has put our school on the map,” said Nopote. She said she was also grateful to his teachers. “To get a learner to get seven distinctions its a lot of work for the teacher, they sacrifice their time after normal workings hours and on weekends when they are supposed to spend time with their families,” she said. She said she was grateful that she was making a difference in a dysfunctional township and sending pupils to universities.